After saying goodbye to our beloved Cusco we pulled in to Arequipa. It is a beautiful city that reminded me a lot of Kings Landing in Game of Thrones. 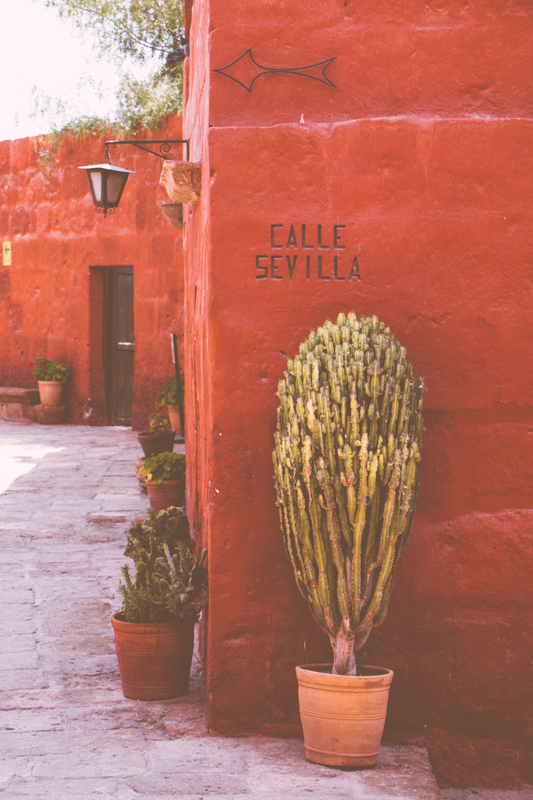 The city is called the White City because it’s made of white sandstone. It was really early when we arrived in our hostel – our 3rd and final Wild Rover chain hostel (meaning we got a free tshirt!) so we went to the TV room to relax. Forrest Gump was on which was awesome so we watched it for the 100th time half dazed at about 6 am. There was a walking tour at 10am so we decided to go on that rather than wait around for our room. We walked to the main square where there was a huge military parade. It was loud. 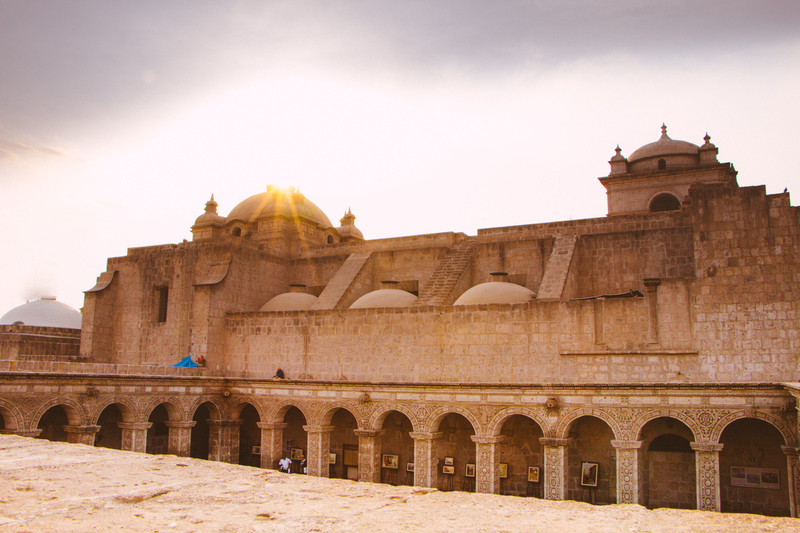 We walked all round old buildings and squares and found out that Arequipa was surrounded by three volcanos called; Chachani, Misti and Pichu Pichu. We continued to walk through churches and lastly the market. 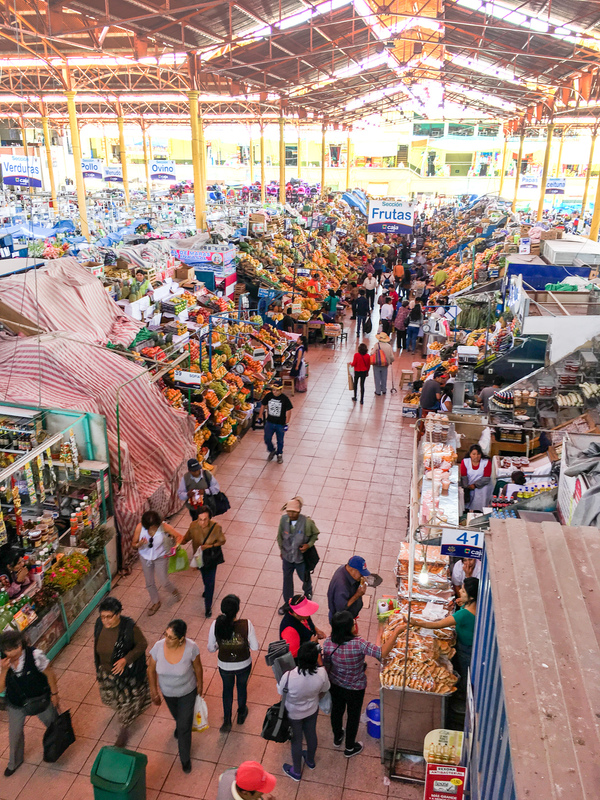 The same guy designed this market as the one in Cusco (Gustave Eiffel, the creator of the Eiffel Tower) and there was witch magic stuff here and loads of fruit, veg, meats and beans. There was bread that was shaped like babies (guaguas).. they’re sold between October and November for the “All Souls Day“. There was also an old traditional ice cream which is famous in Arequipa called cheese ice cream. It’s only called that though due to the look – because there is no cheese in the ingredients, it was nice but nothing outstanding. We went to an Alpaca wool place and saw different all the different types of Alpaca wool available – incredible selection and range. 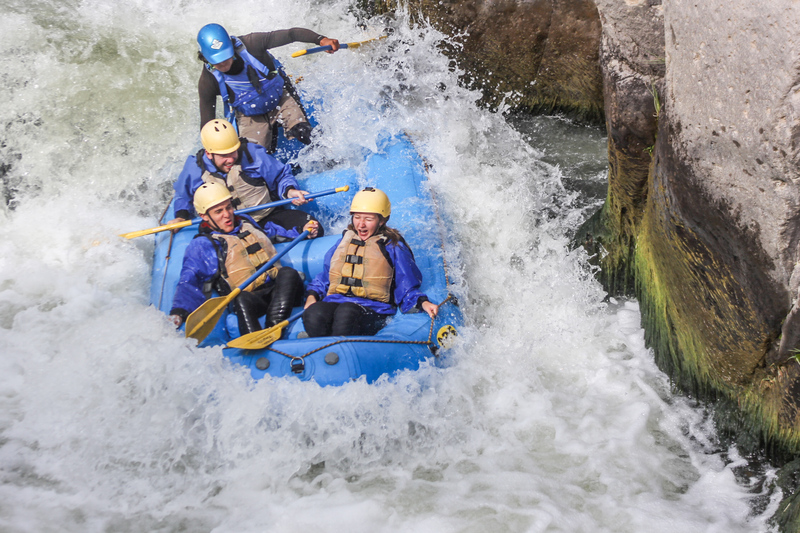 After rafting in the Inca Jungle I really wanted to do it again and we had the opportunity to do it here in Arequipa. We funnily met a couple we saw on the inca trail but they didn’t manage go rafting that day so they were doing it here instead! The rafting was a good laugh but I feel like the ones on the inca trail were far better. I don’t know why it just seemed like more fun! Although I can’t wait to do it again if the opportunity arises. 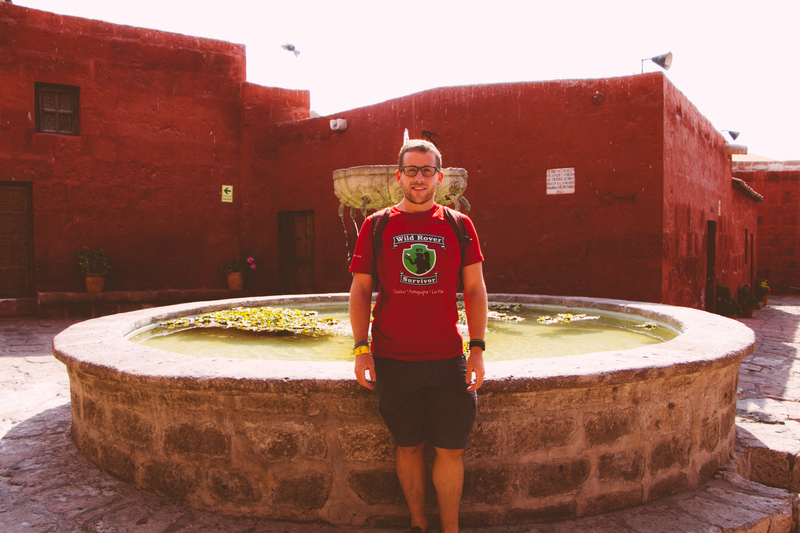 On our last day in Arequipa we went to Santa Catalina Monastery. I was a bit sceptical at first but once inside it was pretty cool. The nuns had it well easy in the early days with servants and the like but then there was reformation and they then had to work for themselves which they do even to this day there. They had to cook, clean and worship in groups together now. Oh and by the way they make killer carrot cake – Alex loves carrot cake and this is was his favourite in the world so far! Well done nuns! Proper tasty. They make soap for church and biscuits too (compulsory walk through the gift shop during the tour) I feel like the money goes to the Pope but I can’t remember what they said. It was a rather intriguing visit which made me appreciate what some people go through for the acceptance from their religion. Alas I cannot judge because these nuns do good for their community. 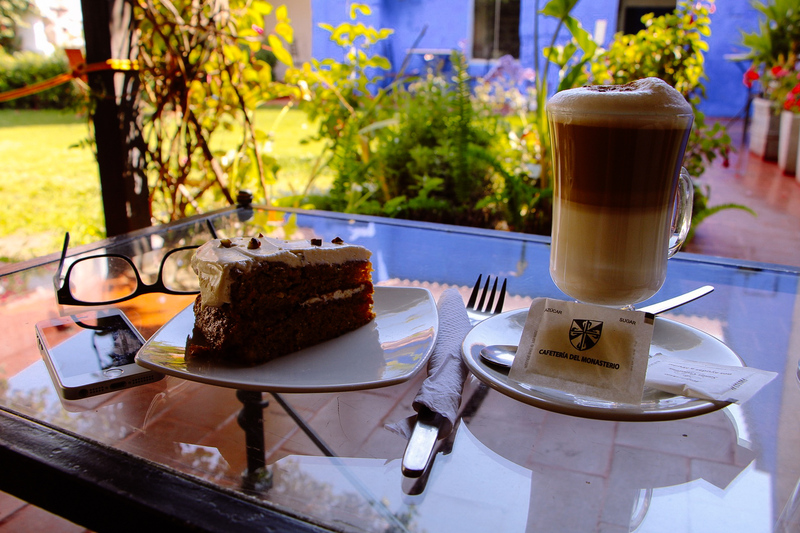 Especially when it comes to tourism, again carrot cake. 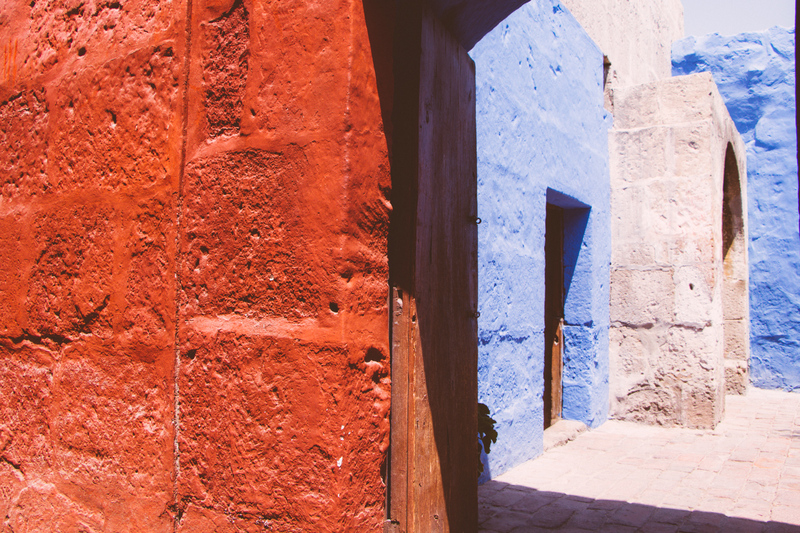 We continued to enjoy the culture of Arequipa, walking around museums and shops. One particularly cool museum was Museo Santuarios Andinos, it contained the famous Juanita mummy, one of the best preserved mummies in the world. Found on Mount Ampato (part of the Andes cordillera) in southern Peru in 1995 by anthropologist Johan Reinhard and his Peruvian climbing partner, Miguel Zárate. 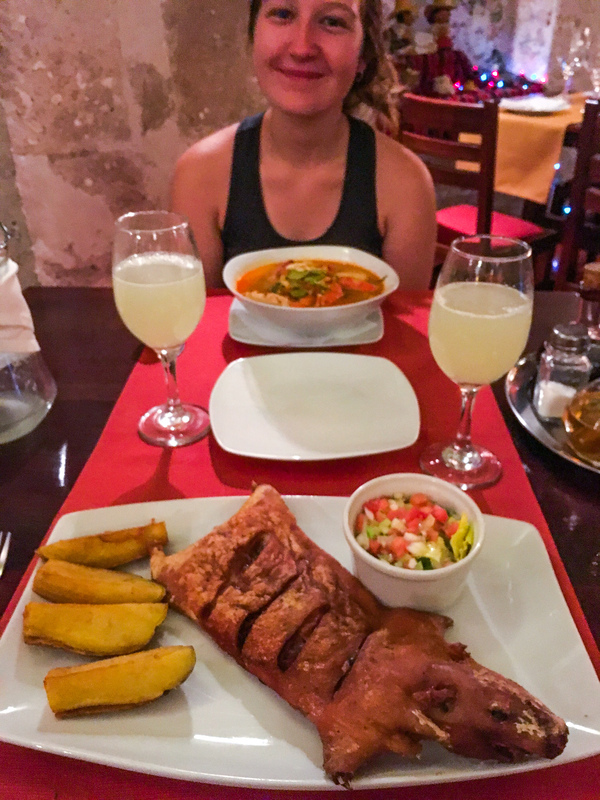 To finish the Arequipa stop we decided to head to a nice restaurant where we finally tried Coy (guinea pig) – we didn’t feel great about doing it, but knew that it’s a local tradition and its to be somewhat respected and we’d probably never have the chance again. I’m glad we tasted it, and especially that we bought it from an expensive restaurant so that hopefully it was treated with at least some dignity, but taste wise it was pointless – very greasy chicken/duck. It even came with all the organs inside and it still had it’s little front teeth and everything! 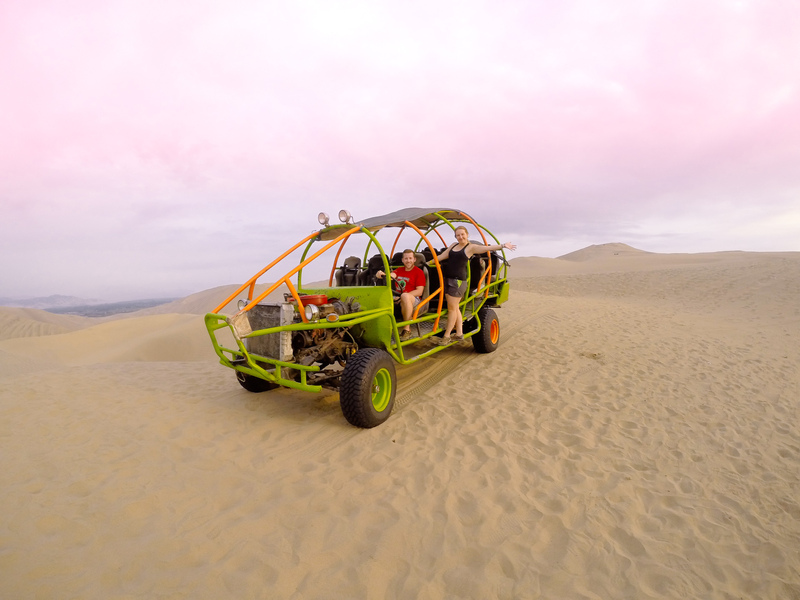 After a very pleasant stop in Arequipa we headed to Huacachina. A desert oasis in the middle of Ica which is on the way to Lima. It was a surreal place, golden sand dunes for miles around and located neatly in the middle of this golden vastness is a green lake. It’s so odd to see, especially the trees which look like they can’t have any roots in the sandy ground. Here we stopped in a place called Banana hostel which included a free sand buggy ride which we of course decided to do! Just before we set off to do it however the previous group returned with a girl who had knocked her self out while sand boarding and a bloke with a broken hand. So a little worried we set off but lucky for us no one got hurt. 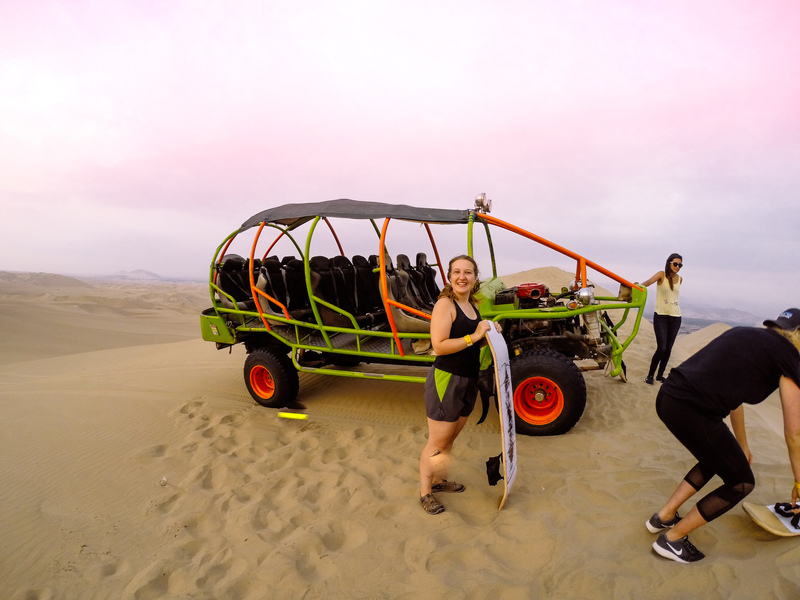 We sped around in a big sand buggy, flying over the dunes, spraying sand all in the air which helped to create a beautiful purple sunset, and then stopping several times to fly down the steep sand dunes only holding on to a rather old snowboard – no helmets, straps or anything – accidentally let go and fall and it’s just you, the sand and a 50 foot very ungraceful roll to the bottom. After our sunset excursion we headed back to the hostel before heading to Lima the following day. Lima was not what I expected. I think I was thinking a La Paz kind of city but in all fairness to Perú it was bloody lovely. A really modern city with some nice places to eat and to shop. 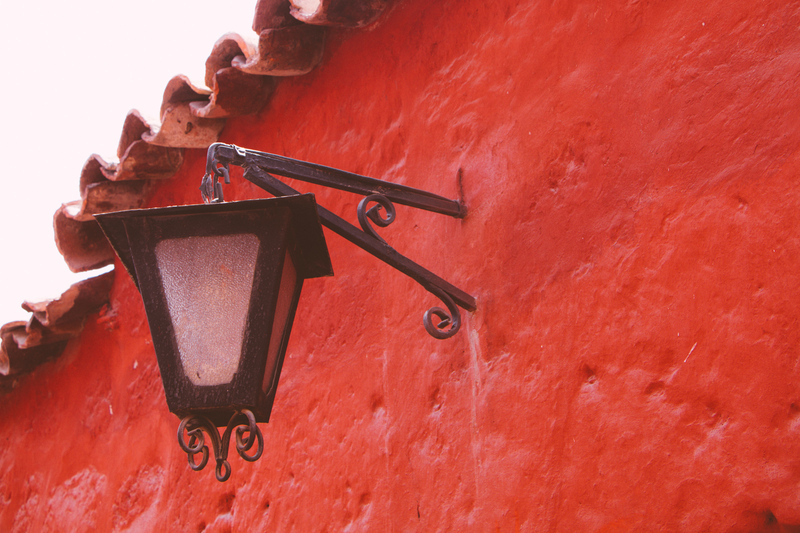 A really good place to end our South America travels at. The first night there we popped out for dinner and had an early night. The next day we went to a really big and luxurious mall and finally saw the new Harry Potter film: “Fantastic Beasts and Where to Find Them” in English rather than Spanish which did take some time to find. The cinema is a real home comfort. The film was really good as well this made us doubly happy. We had a look around the shops and ate the Perú version of Wagamama (Japanese food)… delicious. The last day in South America we decided to walk around Lima. There was a marathon going on or something because there were people everywhere, some were dancing and some were what I think the term is Zumbaring (fitness sort of thing)? 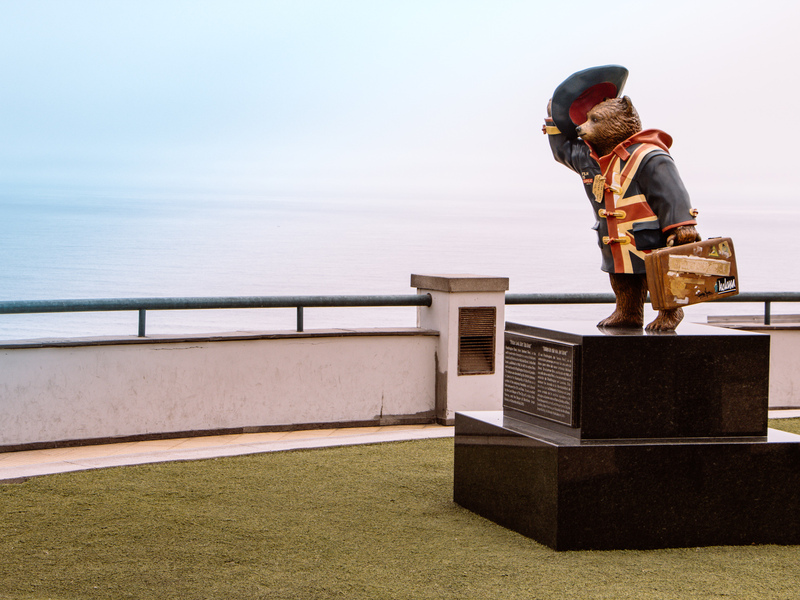 We met Paddington bear which was a highlight for me because I love Paddington and he lives in deepest darkest Perú. We also saw the coast of which we would be flying over in a couple days to head to Mexico and then San Fran. 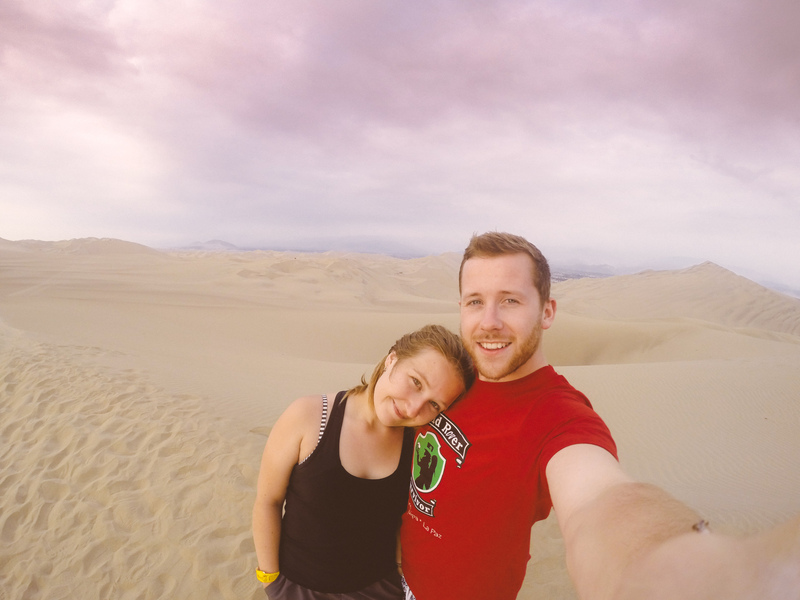 Saying goodbye to South America was hard – we have made some great memories here that we’ll never forget, from crazy taxi drivers, to nearly missing buses, jumping off cliffs, being thrown off horses, falling off bikes and being second in a crazy beer pong competition. It’s safe to say South America you’ve been a blast.